Removal of Live Security Platinum Modded Versions are quite difficult and here is a detailed guide. Live Security Platinum is a fake antivirus which is a worm. Few hours ago we got infected with this one on Windows 7 on Mac. So this guide on Removal of Live Security Platinum Modded Versions is a kind of “Live Guide”, indeed ! There are security Gurus, whose blog helped us a lot, the described methods for Removal of Live Security Platinum was for usual version. Its actually a malware known as worm. It has high replicating capacity, needs practically no action to get installed on your PC. For our case, the process was a simple click from an email from among kind of relatives. The link had nothing, but probably the webpage had the stuff. It faked Adobe Flash Player update, even an experienced does the wrong : Adobe Flash Player update would never run when a dependent browser (Opera in our case) is running. Immediately it made the running Anti Virus Inactive, made Internet connection closed and claimed the whole system is infected. Practically your PC will appear a solid crap to you. Please try to read the above linked articles first for Removal of Live Security Platinum, if you can not remove it by the above methods for Removal of Live Security Platinum or a modded version is present, follow our method for Removal of Live Security Platinum. For Removal of Live Security Platinum Modded Versions, there is no meaning to work from normal mode. Simply restart the PC press F8 key few times and a black screen with Boot Options for Windows will appear. Enter in to safe Mode. Here is no Live Security Platinum is running but screen will be of lower resolution by default. Its eye blinding, so right click on the desktop and set the normal screen resolution. We are taking that, you are using Windows 7. Its must to do all the steps for Removal of Live Security Platinum Modded Versions mentioned hereafter. 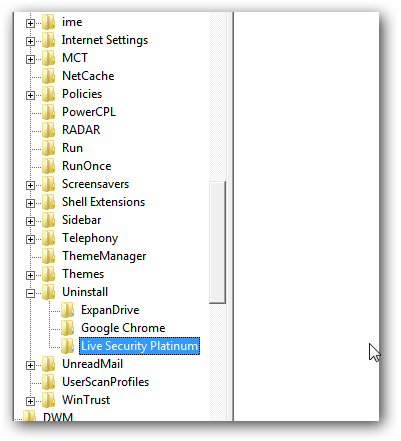 The reason to take screenshot during this step of Removal of Live Security Platinum is to get where its folders are. Its actually was on Program Data Folder in our case. Keep in mind to make all the hidden and system folders visible, otherwise you will not find the folders ! From the Registry we got the path ! Now, you need to reset your Internet Connection first. Most of us uses Mobile High Speed Internet Modem today. Its great. Simply uninstall it. Restart your PC in normal mode. You will see, Removal of Live Security is successful partially – at least its not running. Now install your Modem by reinserting, it will itself reset all the stuffs. Uninstall your current Antivirus. Download the latest, update it and run a full scan. This ends the story of Removal of Live Security Platinum Modded Versions. Case to case there might be a bit variation – you can alter it from our method of Removal of Live Security Platinum Modded Versions, is not it ? We said many a times, please do not access your server (SFTP / FTP or even Shell) from a Windows PC. Ubuntu costs nothing, its more safer for the others. During Removal of Live Security Platinum, your PC might get hot as the fan might not work. Use ice packs (put ice cubes inside plastic packets) from outside if temperature goes high. This Article Has Been Shared 7668 Times! Cite this article as: Abhishek Ghosh, "Removal of Live Security Platinum Modded Versions," in The Customize Windows, July 22, 2012, April 21, 2019, https://thecustomizewindows.com/2012/07/removal-of-live-security-platinum-modded-versions/.